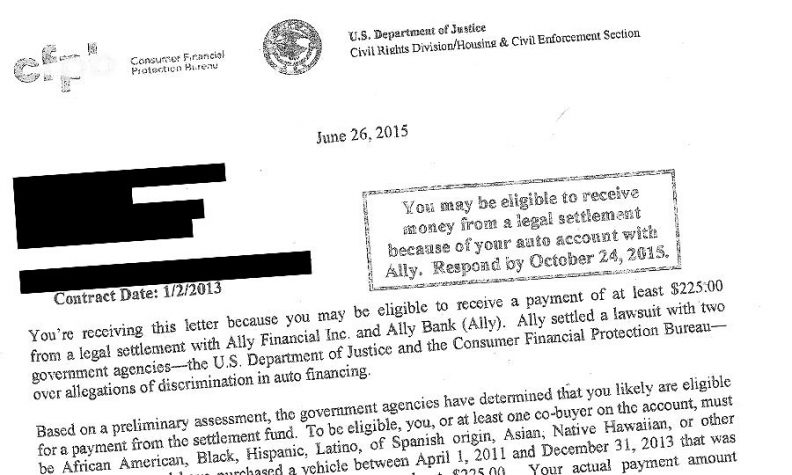 Consumers eligible to participate in Ally Financial’s settlement with U.S. regulators over alleged discriminatory auto lending practices could receive a payment of at least $225 from the settlement fund, according to a letter sent to a refund candidate that was obtained by Automotive News. The letter appears to be the first indication of the estimated minimum payment consumers would receive if they are eligible. The final payment could be greater depending on how many eligible customers participate in the settlement, the letter said. Ally paid $98 million -- $80 million in consumer compensation and $18 million in penalties -- under its 2013 consent agreement with the Consumer Financial Protection Bureau and U.S. Justice Department. Approximately 235,000 consumers may be eligible for the refund, according to the CFPB. According to the letter, consumers, before receiving a payment, must fill out a form to confirm that they are part of a legally protected class and return the form to the Ally settlement administrator by Oct. 24. “To be eligible [for payment], you, or at least one co-buyer on the account, must be African American, Black, Hispanic, Latino, of Spanish origin, Asian, Native Hawaiian, or other Pacific Islander and have purchased a vehicle between April 1, 2011, and December 31, 2013, that was financed by Ally,” the letter said. A copy of the letter sent to a refund candidate that was obtained by Automotive News. Consumers do not need to currently have an open account with Ally, and accounts that went into default still qualify. The CFPB and Justice Department expect checks to be mailed to eligible customers later this year or early next year, the letter said. Patrice Ficklin, CFPB fair lending director, and Steven Rosenbaum, chief of the housing and civil enforcement section of the Department of Justice, signed the letter. In the 2013 consent order, the Consumer Financial Protection Bureau said that affected African-American borrowers on average paid 0.29 of a percentage point more than non-Hispanic whites with similar credit scores. That amounts to about $300 more over the life of the loan. Hispanic borrowers paid an average of 0.2 of a point more, and Asian or Pacific Islander borrowers paid 0.22 of a point more. Both groups paid about $200 more than non-Hispanic whites over the loan period. The Ally settlement came after the CFPB accused the finance company of discrimination through dealer reserve, the percentage of interest a lender allows a dealership to add to an auto loan as a fee for arranging the loan. The CFPB opposes dealer reserve, saying it results in minorities paying higher rates. The CFPB calls that disparate impact illegal, even if the discrimination was unintentional. The bureau determines disparate impact based on a methodology which relies on address, name information, the census surname list and census demographic information to verify a person’s race or ethnicity. The CFPB has said it wants lenders to switch to nondiscretionary compensation for dealers, such as a flat fee or a fixed percentage of the amount financed, to eliminate discrimination. Last month, American Honda Finance Corp., also settled with the CFPB and Department of Justice for alleged discriminatory auto lending. Honda’s finance arm agreed to cap dealer reserve at 1.25 percentage points for loans of 60 months or fewer and at 1 percentage point for loans longer than 60 months. Honda Finance also agreed to pay 24 million to consumers allegedly harmed by auto-lending discrimination and $1 million into a fund to promote consumer financial education.